Nicole is the Program Manager at NACTO supporting Cities for Cycling, and the Better Bike Share Partnership. Prior to joining NACTO, Nicole worked with the Lower Manhattan Development Corporation managing grant funded community development projects, the NYC Taxi and Limousine Commission on wheelchair accessibility initiatives, and MTA Bridges and Tunnels where she worked on the implementation of citywide cashless tolling. Nicole holds a Master of Urban Policy Analysis and Management degree from The New School, and a Bachelor’s of Science in Urban and Regional Planning from East Carolina University. 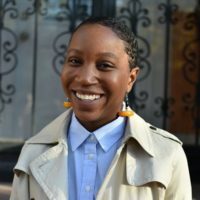 Nicole is passionate about the role of community engagement in the development of public resources, and the use of transportation programming and policy as a tool for social equity.